BALTIMORE (USA), 30 August – Lecturers of the Department of Nursing and Rehabilitation and the Faculty of Medicine and Health Sciences (FMHS), Universiti Putra Malaysia (UPM) have embarked on a collaboration whereby Associate Prof. Dr Soh Kim Lam has undergone a research attachment as a Visiting Scholar at the John Hopkins School of Nursing in Baltimore, USA through a Nobel Laurette Programme initiated by the Research Management Centre in UPM. The research attachment has given Associate Prof. Dr Soh a valuable opportunity to develop strategies to establish collaborative relations between the two universities particularly in publication and research. It was also used to discuss opportunities for initiating a Memorandum of Understanding (MoU) between the two universities. Throughout the programme, Associate Prof. Dr Soh was supervised by the Dean of John Hopkins School of Nursing, Prof. Patricia Davidson who is also the mentor for the Visiting Scholar Programme. During her speech at the State of the School Programme, Prof. Patricia Davidson stated that John Hopkins University was truly pleased to have determined academic staff joining them, and she was honoured and would welcome the visits of high potential academic staff from foreign countries who were interested in collaborations. John Hopkins School of Nursing has a stable financial status due to the strong support from the government. John Hopkins School of Nursing is also known to generate high income. “To further establish John Hopkins School of Nursing globally, an allocation of AS$6 million is used to revamp the building infrastructures and staff offices which are presently carried out,” she said. During the research attachment, Associate Prof. Dr Soh Kim Lam had the opportunity to discuss with Associate Dean of International and Global Affairs, John Hopkins School of Nursing, Professor Nancy Reynolds the ways of turning the Department of Nursing and Rehabilitation, UPM into one of the Centres of International Collaboration. The attachment research also paved the way for the discussion of collaborative opportunities especially in the application of international grants with Dr Tamar Rodney, who is the academic staff of John Hopkins School of Nursing. Dr Rodney asserted that she was always open to collaboration in the field of research with international academic staff. She then commented that the discussion with the academic staff from Malaysia was the first time for her, and she hoped that the collaboration will be realised soon. 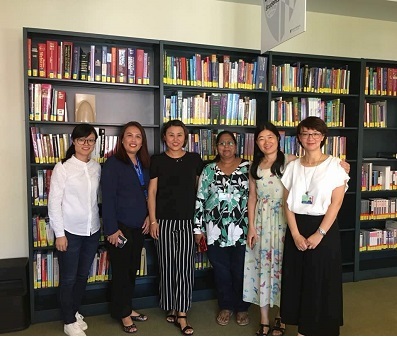 Throughout the programme, the John Hopkins, School of Nursing has given an opportunity for Associate Prof. Dr Soh Kim Lam to interact and collaborate with the Visiting Scholars from other countries such as University of Western Indies, Trinidad and Chengdu University, China. The research attachment was also fully utilised with the visit to the facilities in John Hopkins, School of Nursing and it was carried out for the purpose of benchmarking. Among the places visited were the Nursing Skills Lab and Sim Lab which are used by the medical and nursing students to facilitate learning.